Garry R. Lee, MD, is internationally renowned for helping you look younger, without surgery. He is the 2018 National Award WINNER for the Best Non-Surgical Makeover of the Year for MyFaceMyBody, the Largest and Most Recognized Awards Program in the World. Plastic Surgeon Paul Nassif of TV's Botched was one of the International Panel of Judges who selected the WINNERS from hundreds of Plastic Surgeons, Dermatologists, and Aesthetic Physicians across the country. 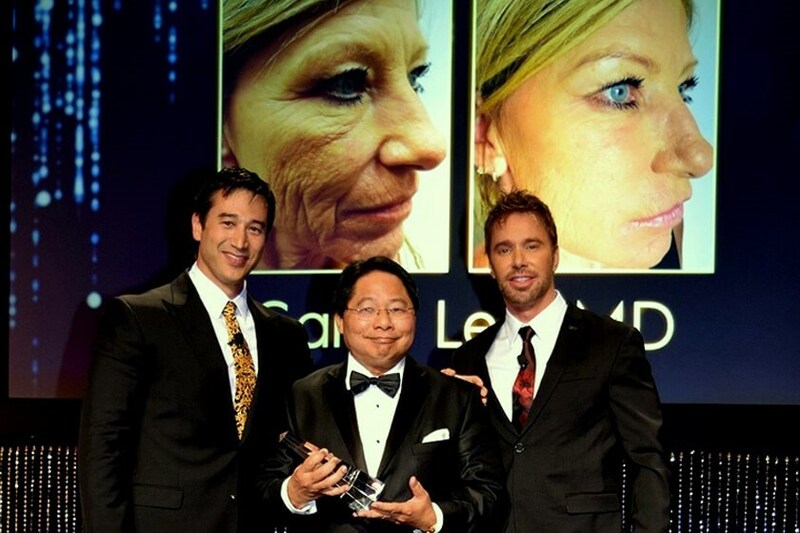 Dr. Lee was also the WINNER of The Aesthetic Award as the Best Facial Injectable Enhancement Physician in the USA in 2015 and led the USA to take 2nd Place in the WORLD Competition for Best Non-Surgical Facial Rejuvenation among 31 of the Top Physicians from 5 continents at the Aesthetic and Anti-Aging Medicine European Congress (AMEC) in Paris, France. 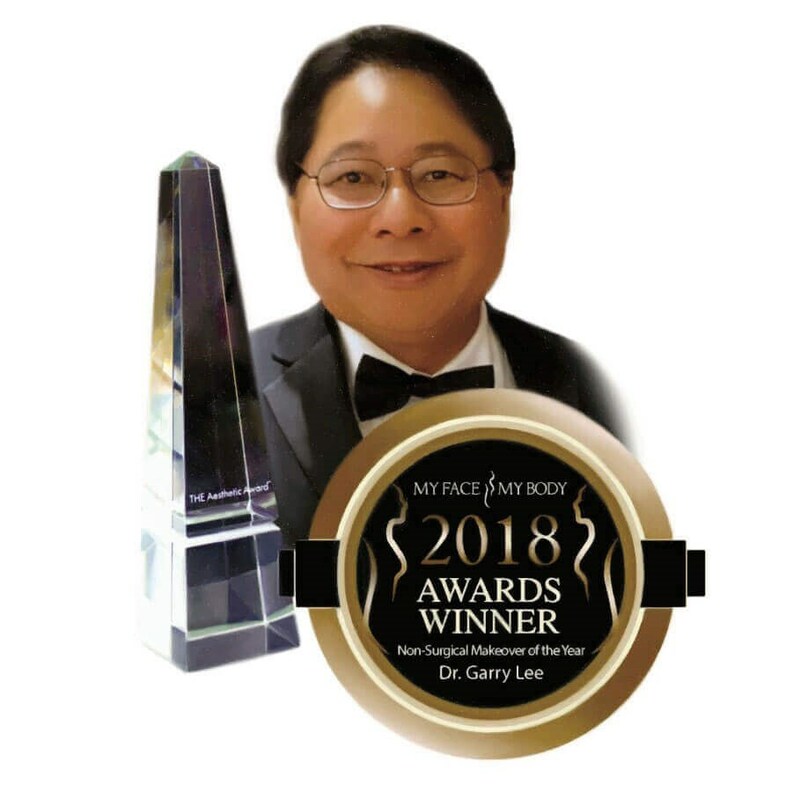 Dr. Lee is an internationally published author, lecturer, inventor, and physician and nurse instructor as a leader in the field of minimally invasive aesthetic medicine. Non-surgical cosmetic medicine has advanced tremendously with incredible advances in technology and techniques, which--when used in combination--may one day approach the results we can only get with plastic surgery. Dr. Lee only accepts a limited number of private patients to treat facial wrinkles and sagging skin, large pores, atrophic scars, sun damaged skin and discoloration, hair loss (alopecia), cellulite in buttocks and thighs, and targeted abdominal fat shrinking. He uses: BOTOX, Dysport, Juvéderm, Restylane, Sculptra, microneedling, Platelet-Rich Plasma (PRP), Skinfinity Radio Frequency, and the Strawberry Laser Lipo--to shrink your body's own fat cells without surgery. His clinic, Look Younger MD, is one of the first in Nevada to offer the PRO-NOX (laughing gas) System to ease anxiety and minimize any discomfort as well as to use the AccuVein System to painlessly visualize blood vessels to prevent accidently injecting into them. Dr. Lee is one of the USA's "thought leaders" as a national and Nevada lecturer and a prominent physician and nurse instructor in the field of non-surgical aesthetic/cosmetic medicine. He teaches for Allergan (Botox, Juvederm), Galderma (Dysport, Restylane, & microcannula), Air-Tite (microcannula), and Eclipse Aesthetics (microneedling, PRP, RF). He also lectured for The Aesthetic Show, The American MedAesthetic Association, Vegas Cosmetic Surgery and Aesthetic Dermatology, The American Academy of Anti-Aging Medicine, The National Society of Cosmetic Physicians, The American Society of Cosmetic Physicians, and the Canadian Academy of Aesthetic Medicine. 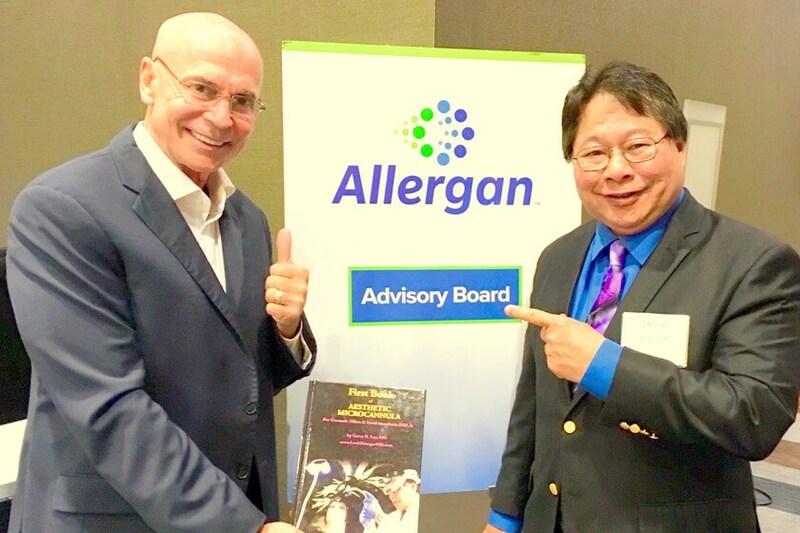 He currently serves on the Allergan Medical Facial Aesthetics National Advisory Board, the Allergan New-Core National Advisory Board, and the Galderma National Advisory Board. Born and raised on the island of Oahu, Hawaii, Dr. Lee's bachelor's degree is from the University of Hawaii--Manoa, his medical degree is from the Ohio State University, and his residency is from Grant Medical Center in Columbus, OH. He was the recipient of the Armed Forces Health Professions Scholarship and was a Major in the USAF serving at Nellis Air Force Base when he fulfilled his active duty obligation to begin private practice. In January 2019, Yelp selected Dr. Lee as one of the few physicians chosen for '' People Love Us On Yelp." 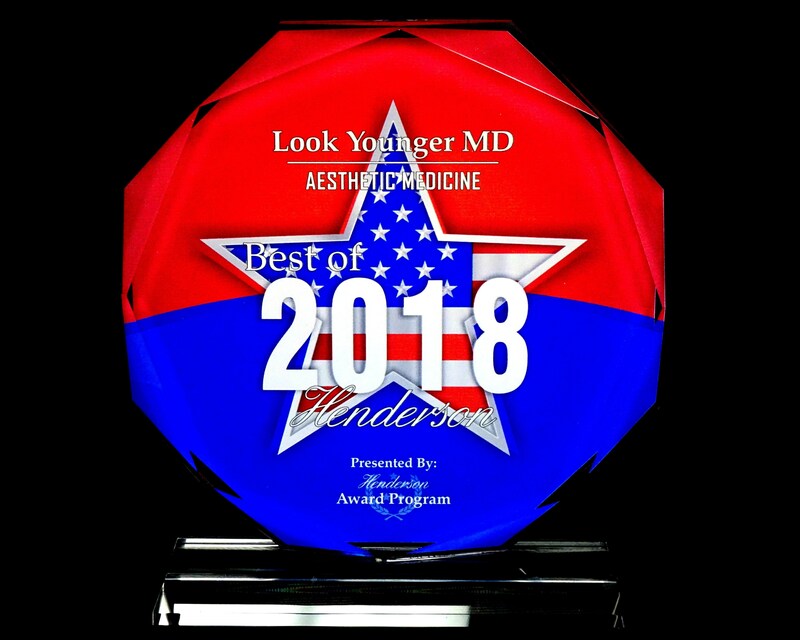 In July 2015, Dr. Lee was the WINNER of the Aesthetic Award for Best Cosmetic Injectable Enhancement Physician in the USA among the top plastic surgeons, dermatologists, and aesthetic physicians in the county. 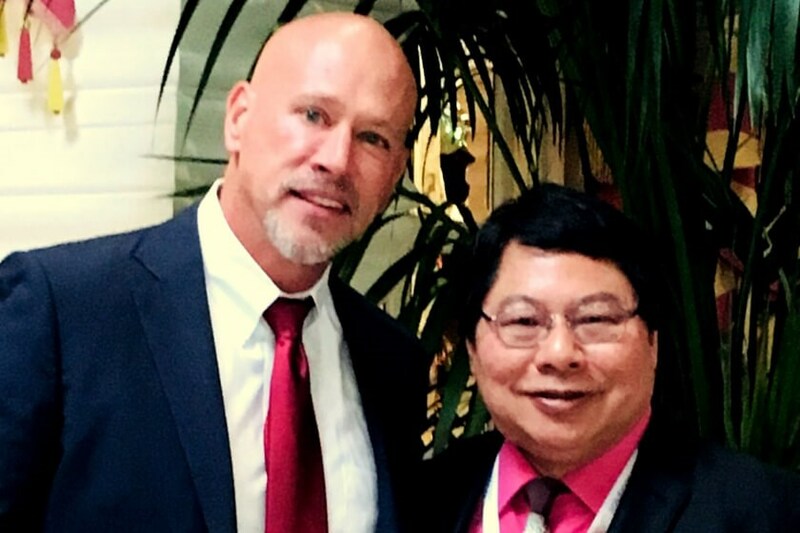 In October 2015, he led the United States to take 2nd place in WORLD Competition for Best Non-Surgical Facial Rejuvenation at the Aesthetic and Anti-Aging Medicine European Congress (AMEC) in Paris, France, among 31 of the top physicians from five different continents. In January 2018, Dr. Lee was voted RealSelf Most Loved Injector of 2017 by his cosmetic wrinkle injection patients. In 2017, Dr. Lee was selected as One of America’s Top Physicians by the Consumers’ Research Council of America. In 2016, he was awarded the Distinguished Doctor Designation Award, conferred only upon the top three percent of physicians in the nation. He was also recognized among the top one percent of America’s Most Honored Professionals in the United States. He previously received The Patient's Choice 5-Year Honoree Award, The Compassionate Doctor 5-Year Honoree Award, People Love Us On Yelp, the American Cancer Society Life Saver Award, Medici's Platinum Award, Thermage's Pinnacle Award (498 treatments), as well as Allergan’s Top 250/Black Diamond (top one percent in the United States), and Galderma’s Presidential Elite Award (top one percent in the United States). Dr. Lee educates physicians and nurses about the latest advancements in minimally invasive cosmetic techniques and technology. He is a CME physician instructor for The Aesthetic Show’s Advanced Injectable Applications and Techniques Course and has lectured for The Aesthetic Show (TAS), Vegas Cosmetic Surgery and Aesthetic Dermatology, The American Society of Cosmetic Physicians (ASOCP), The American Academy of Anti-Aging Medicine (A4M), The Canadian Association of Aesthetic Medicine (CAAM), and The American MedAesthetic Association (AMAA). In July 2018 at The Aesthetic Show, he did a one-hour live demonstration of the injection of Restylane Silk into lips using a microcannula for Galderma, a CME lecture on scars, and a lecture on the prevention and treatment of cosmetic filler complications. In June 2018, he did a Workshop on the use of microcannulas for Vegas Cosmetic Surgery and Aesthetic Dermatology. In February 2018, he also lectured for The American MedAesthetic Association on non-surgical techniques. In February 2017, Dr. Lee did a lecture and a demonstration for the AMAA Leadership BootCamp in Las Vegas, NV and hosted the event as Executive Director of The American MedAesthetic Association. He also did two lectures at The Aesthetic Show 2017 on cosmetic fillers and the prevention and treatment of filler complications. At The Aesthetic Show 2016, he presented four lectures on plasma technology, combination treatments, hyaluronidase enzyme, and microcannula techniques. He also lectured in September 2016 for The American Society of Cosmetic Physicians in Scottsdale, AZ and for The Canadian Association of Aesthetic Physicians in Toronto, Canada. In 2015, Dr. Lee lectured for the American Society of Cosmetic Physicians, The Aesthetic Show, Vegas Cosmetic Surgery and Aesthetic Dermatology, and The American Academy of Anti-Aging Medicine. 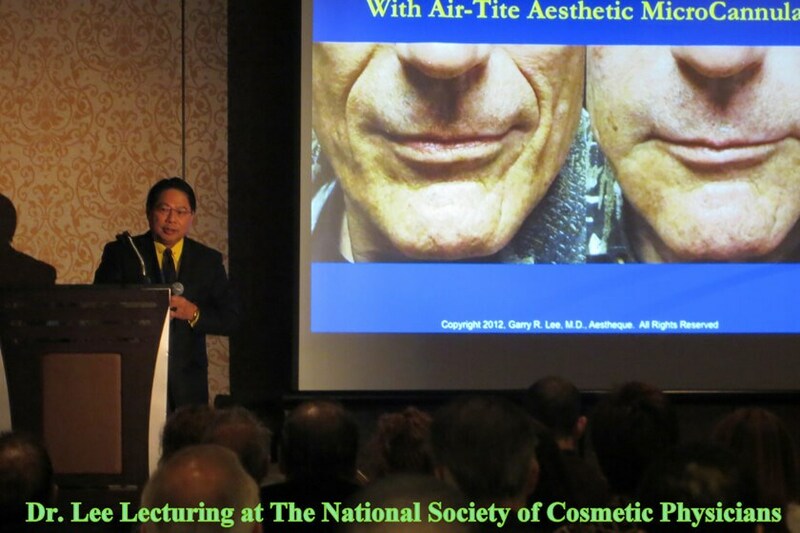 Previously, he taught at The Aesthetic Show in 2014 — including The Advanced Injectable Applications and Techniques CME Course, The Aesthetic Show 2013, and The National Society of Cosmetic Physicians 2012 — with the TSK by Air-Tite Microcannula Physician Workshop. Dr. Lee was also Assistant Instructor in Sclerotherapy (Spider Vein Treatments) for the National Procedures Institute. Dr. Lee is the inventor of several advanced cosmetic injection techniques including The Long MicroCannula Double Cross-Hatched Fan, Microcannula Injected Local Anesthesia (MLA), Microcannula Bruise Reduction, Needle Bruise Reduction (NBR), and The Wiggle Progression techniques. He is an international/national physician lecturer specializing in advanced anti-bruising and anti-swelling cosmetic injection techniques, and the latest nonsurgical cosmetic technology. 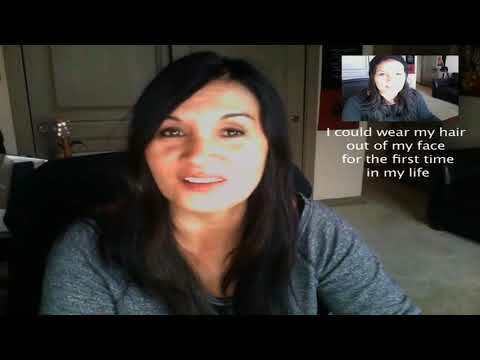 Above: Dr. Lee's Amazon.com Book, Magazine Articles, and Interviews on Looking Younger, Without Surgery. Dr. Lee is the author of The First Book of Aesthetic Microcannula for Cosmetic Fillers & Local Anesthesia (MILA), the first book in the world that is dedicated to these advanced cosmetic injection techniques. It was voted as Amazon’s number one “Hot New Release” and was a best seller. Additionally, Dr. Lee’s articles were nationally published in the 2012 issues of both MedEsthetics and The Aesthetic Guide magazines. His first article of 2014 (on Juvéderm Voluma) was published in the March 2014 issue of MedEsthetics, and his second article of 2014 (on PRP or platelet-rich plasma), co-authored by plastic surgeon Gordon Sasaki, M.D., F.A.C.S., was published in the September 2014 issue of MedEsthetics. 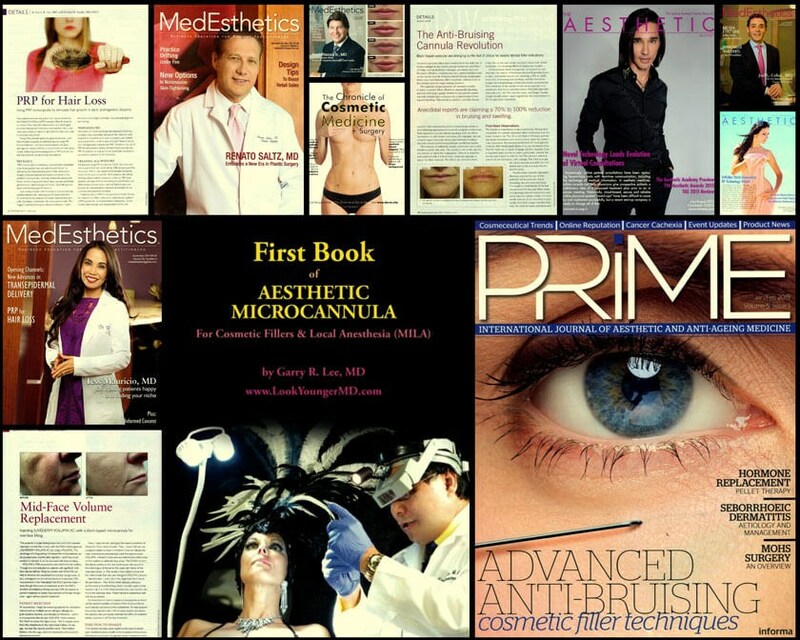 In 2015, Dr. Lee was honored to be chosen as the cover article of the peer-reviewed January/February 2015 issue of PRIME: International Journal of Aesthetic and Anti-Aging Medicine in Europe and in North America on “Advanced Anti-Bruising Cosmetic Filler Techniques.” In January/February 2017, Dr. Lee was extensively cited as one of the leading experts in MedEsthetics “Opening Channels” article on microneedling and platelet-rich plasma in the U.S. In the same MedEsthetics 2017 issue, Dr. Lee’s patient photos were used to illustrate the best in the “Lovely Lips” article using Juvéderm Ultra on one patient in comparison with the new FDA-approved Juvéderm Volbella on another. In addition, Emily Innes-Leroux’s 2018 in-depth interview with Dr. Lee was published as "How to Manage a Hyaluronic Acid Filler Complication" in The Chronicle of Cosmetic Medicine & Surgery in Toronto, Canada. Dr. Lee is the Botox, Juvederm, Dysport, and Restylane physician and nurse instructor for beautiful and natural results.